Approximately 45 minutes drive, 65 km north east of Stratford lies the small township of Whangamomona. This quirky town located in the rugged hill country is rich with pioneering history. Settlers first arrived in 1895, and the town was established 2 years later. 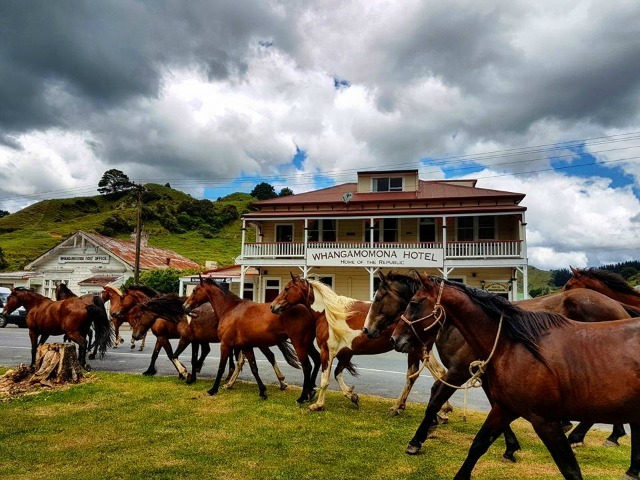 Whangamomona is one of the highlights along the Forgotten World Highway, a trip you’ll be glad you made. What makes this town so out of the ordinary? The local’s passion and sense of humour. In 1988 the local government shifted the district boundaries to one that was in line with the watershed of the main rivers. Initially belonging to the Taranaki district, half of Whangamomona was now classed as belonging to the Manawatu region. This did not sit well with the Whangamomona locals, as the decision was made without their consultation. Whangamomona residents made a major decision - to proclaim independence and declare themselves a republic, complete with a President. Whangamomona republic’s President. Not to take the whole thing too seriously, the elected presidents have included a goat called Billy the Kid, Tai the poodle and Murt the turtle. 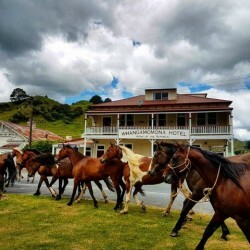 A main attraction in Whangamomona is the local Hotel, one of the most remote country hotels in New Zealand. Although the original Hotel burnt down, this one was built on the same site in 1912. Stop in for lunch and a drink and view the collection of photos and memorabilia illustrating the town’s history. While you’re there don’t forget to get your passport and a stamp to remember this iconic New Zealand town. Whangamomona, the controversial little town who declared themselves a republic. This country town is like none you’ve come across before. Appreciate the history, culture and beauty of the rich country hills. A day trip in itself, or a favourable stop while travelling along the Forgotten World Highway. Definitely not! Visitors travel from far and wide to celebrate with the locals, the more the merrier. You’ll pay a small fee when you first drive into Whangamomona on Republic day. This gives you a “passport” to enter the republic.